I do like to shop… and I do like to travel, so shopping while travelling is a win win situation for me. Especially when amazing bargains can be found. The only dilemma is carrying what you buy. My bags get so stuffed it is impossible to carry them! Oh and if you have the unfortunate debacle of having a backpack stolen. True story for another day. This trip I was savvy and sent a box of shopping home from the US, since I still had to backpack my way around South East Asia. Here are some of my recent buys! It seems like it is always this time of year when I need a challenge of the wardrobe variety. Somewhere between the end of winter and the beginning of spring, where I need something else besides my muddled brain to help choose what I wear each day. In 2011 it was Shoesapalooza. Last year the 30 Days of Accessories Challenge. This year, it’s Colour Fest! I’ve always loved wearing colour, and my wardrobe has many different tones and hues. I’m pretty lucky that I look good in nearly all colours – brights, pastels, jewel tones… everything except bone/camel neutrals, which tend to wash me out. This year it’s less of the rules and restrictions, and more of a challenge to create outfits based on a colour family. I won’t be limiting myself to ticking off a colour each day, who knows – I may just love a colour combo so much I wear it for a week! 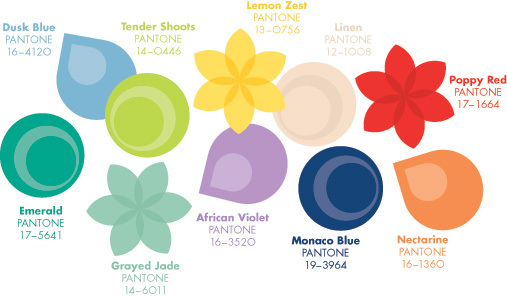 So the general idea is that I’m going to pick a colour from the Pantone Spring or Fall Collection for 2013, and base my outfit around it. Here are the selected colours for Spring. And here are the Fall colours (or as us Southern Hemispherians call it – Autumn). Already I see that some of those colours will be a challenge as I have little of them in my wardrobe! I can use clothes, shoes, accessories and jewellery to base around those colours, it’s less of wearing one colour head to toe and more of making that colour the standout of the outfit. I do know a lady who wears shades of purple to work every day. Whole outfit. Head to toe. Purple every day. She reminds me of a big juicy plum or grape. Cool? Weird? Still undecided. And since technically the shopping ban ended at day 30, here are some recent purchases! Wanted: Navy or blue shoes – to go with those outfits that have no black so black shoes are out. Along with never-knew-I-needed-them-but-know-I-can’t-live-without-them $8 pink snake skin flats and Missoni inspired print flats for $19. Found: On Sale! Two items for $10! And of course I bought more, it was 2 for 10 after all! Found: Awesome bangle stack – also part of the 2 for 10 deal! Well the last 4 days have been a very busy blur, both work wise and social wise (think girls dinner, brunch, birthday lunch and hens night) and I will just do a quick recap of the accessories from the last 4 days.